Privia specializes in capture & proposal management software and services. "My found memories of Privia"
Over the course of my many years as AMS and then CGI I was involved in responding to many very large very complex RFPs for government contracts. We used Privia as the workspace tool to organize the work of our large distributed teams. The best thing about Privia is it is nearly invisible. 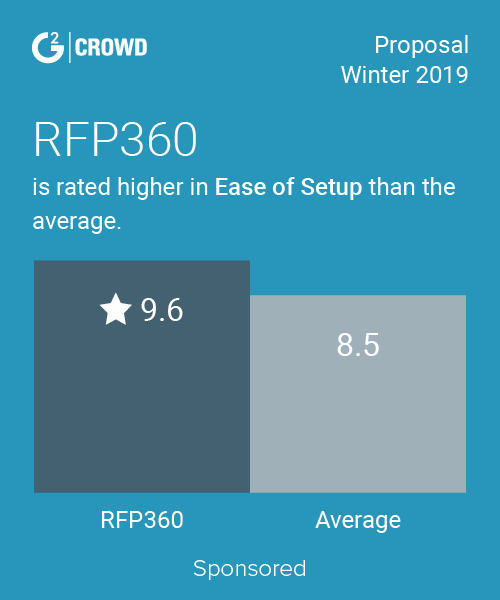 It does its job in such an intuitive way and is so well tuned to the task that you hardly notice it's that, that is until you, as I did, move to another company without Privia and suddenly the job of creating an RFP response becomes a much more painful endeavor. I highly recommend Privia. None - I really can't think of anything. Organization of the writing process for complex documents among a distributed team. "Don't do a proposal, RFI response, even some post-award deliverables without it!" ease of management and use, ability to secure items at the document level, version control, and ability to control user access at the admin level in seconds. Way better than SharePoint!! And much easier to use. Streamlines proposal development and allows security control at the document level. Prevents accidental deletions of documents or versions. Tracks who made changes to each version, allowing proposal manager to get clarifications from the author, if necessary. "Perfect product for capture management"
Ease of use, fast customer support, excellent ability to maintain document integrity during the capture process. The continued upgrades and enhancements make this product top-notch. I am continuing to learn new features of the product, and have always been pleased with the ongoing dedication to enhancements the company strives for. Having both a Platform version, and Web version, allows for utilization across account teams, as well as for teaming partners. Documentation is excellent, and support always at hand to answer questions regarding features. There is very little to dislike, and if any issues are encountered, customer support is quick to respond. There are features that are being updated, which will increase productivity on the administrator side, but from an end-user perspective, the system is an excellent solution for teams, and very few members have expressed any dislike of the product. This is a great product, and a great company. I cannot recommend them enough. The ability to manage many proposal captures in one easy repository. The ability to allow teams to develop with the security of strong document permissions and versioning allows for excellent task management. Having capture management in one location, with a standard set of tools allows for teams to focus on the quality of the work. The benefits of working in Privia is the ability to maintain one single repository of existing captures, which allows for continued reference for later teams. "Proposal and Contract Management Today"
Cradle to grave management of an opportunity. We have opportunities DOD and DOD IC. We use Priva to update our pipeline, develop business development milestones that send updates to the business development owner and assigned participants. Calendar items are generated (schedule of events) and if the opportunity is approved for pursuit after the pursuit review, we deploy the business development workspace and proposal workspace. This includes capture management, process milestones, and processes. We then ensure the folders are updated with the proper artifacts. Our folders were structured to manage DOD and DOD IC contracts it doesn’t matter what type of contract to include task orders, purchase orders, etc... If the opportunity is won we deploy the opportunity to contract operations. We altered the contract information database to resemble our DCAA contract briefs. We used Privia's collaboration tool for open integrated communication online with participants on any proposal effort. Comments can be made anywhere in the document simultaneously. This works well during our color team reviews. We used Privia's expertise to develop and create templates specific to our organization’s needs. Privia also had templates available for us to alter to our internal and external operational processes. What I dislike is my lack of understanding of what the roles and responsibilities are when assigning to each user. The roles and responsibilities must be assigned properly. I also dislike folder ownership and transfer management. Take the time and baseline your operations and support operations. Understand what information should be shared amongst departments. Determine what your incomes and outcomes are. Develop your goals and objectives. Present this information to a Privia consultant and your needs will be met. Understand your business processes fully. Always focus on continuous improvement! We have completely integrated the cradle to grave management of an opportunity. We have electronic management of all operational documents and contractual artifacts. During an audit internal, external, DCAA etc... All artifacts are in one location along with the historical records. It allows for the support operations of an organization to collaborate and share information for example the human resource department stores resumes and performance evaluation as well as store and prepare resumes and letters of intent for the proposal effort. The accounting department manages rates, the cost proposal, invoices and monthly reporting requirements. The recruiting department uses Privia as a source to support future opportunities. The senior management uses Privia to store strategy, new business review processes and procedures, and corporate governance tools for the organization. Privia is used by our management team to holistically manage opportunities and operations of a contract vehicle. All in one location. Priceless. "Eight Year User - Love It! Great content management and workflow Proposal Management Software." Running a proposal using Privia is seamless. During a proposal, having document control down to the levels of editing, writing, viewing, and overall access is critical. This program provides extensive controls when needed. Also, different levels of user rights provide a proposal manager the ability to manage a response and your team members without any issues or lost information. The version control feature is irreplaceable and a must for all proposal professionals. The new search capabilities is similar to Google search and is a real time saver. The capture tool monitoring future procurement efforts and alerting managers of milestones for current efforts places less demands on capture professionals. Can't say enough about this software. As far as the previous review titled "Privia Pain" and dated May 14, 2015 pertaining to "losing information" . . .There is no way this can be true - had to be either a user error or computer issue - no way it had anything to do with the software. The software retains all versions and even sets up a "special" temporary file location on your individual computer should your actual computer crash or you lose internet connectivity. Privia has saved me hours of reconstructing 1,000 page documents when a company had internal, uncontrollable mechanical and technical issues. However, I don't care for how there are two interfaces - Privia Web and Privia Platform. The Platform interface is great and very, very easy to use. "Drag and drop" content management, etc. The issue is - when you want to access all the tools of Privia (Capture tools, reporting, workflows, etc.) you, as a user, must use the Privia Web interface ONLY. I use the Platform version the most during proposals due to ease. Switching back and forth between the interfaces is a pain as you must sign in and out of the software. Plus both interfaces look and act differently. Talk to a company that is currently using the software for their proposals. Also, ask for an onsite demo if you have any doubts. In addition, include your technical folks so they too can see the software and see the amazing administrator tools that make it possible for regular employees to assist with administrator duties. Privia is a software that provides controls down to the individual user and therefore makes it possible to alleviate your Technical personnel's duties and responsibilities making their lives less stressful. I travel as a consultant to organizations all over the world. I work with dispersed teams and being able to collaborate using one tool and also having different user level access (contractors, employees, teammates) makes for a easier team environment. The notification feature alerts you when a writer in another country has completed their changes or edits to a section no matter what time zone you are located in. The commenting review feature is a tool which makes virtual color team reviews possible. The reconciliation of comments in either Excel, Word, or Privia's Commenting tool, makes addressing reviewers concerns and assuring compliance a breeze. "The Bst Bid and Proposal Management Software Available"
The ease of use/Intuitive design of the tool. From adding users to creating workflows, it all makes sense. Once thing I dislike at this time is the commenting on photos/graphics. I hear it is in the works or maybe I was using an older version, but this is something that I would like to see. I would recommend not only having a demo done at your office, but I would suggest you see if your company could use the software on an opportunity that you have coming up. They are more than willing to do this for you because they know they have a great product. It is not only easy to use for internal purposes, but if teammates are involved, it is very easy to add them to the system as well as remove them. The one issue I see being solved in my case is that NO ONE enjoyed using SharePoint. Since we have introduced Privia, employees/coworkers have slowly began to use the tool. I can truly say that we use Privia more than we ever used SP because of how easy it is to use vs. SharePoint. The benefit that we are realizing is that people are willing to work on the tool so we, as management, have a better picture of the project at all times. Our saying is that "If it's not in Privia, it doesn't exist." We have bought into this and through the ease of use for Privia, people are willing to upload/post/publish their work to Privia (it's just clicking one button vs. several for SP). The customer service we received while using the product was absolutely exemplary. The team was very responsive and worked closely with us to ensure our needs were met always. The system is quite expensive, although you tend to get what you pay for. Take the time to plan your implementation out well before you begin the implementation. If you have to make modifications to the infrastructure after the fact, it will be much more difficult than if you plan up front. We no longer use Privia, due mainly to expense. The business problem we were solving was mainly version control in our collaboration processes. Privia allowed us to seamlessly manage versions in all our work products. None of it. Too many issues loosing data and system failures. I found Privia to be very unreliable. Files would go missing, the system would crash and too much time was lost trying to find what I was looking for to find it was gone. I had current documents completely disappear and had to revert back to work previously done. A complete waste of time. Caused too much frustration. Get rid of it. Too many issues, lost data, lost time. It was being used for proposals and version control. As we kept having system issues and having to revert back to previous versions this wasn't the best solution. We never realized any benefits due to all the issues experienced and loss of wasted productive work time. Several key personnel would be taken away from their workload to try to resolve issues surrounding Privia at least 3 days a week. Not worth the investment versus the time spent trying to resolve the issues twelve to fifteen times a month. "Good Tool - Could be Great"
Version control is fairly transparent and easy to use/understand. Difficult to search for specific work spaces and documents. Difficult to control permission levels - not enough options. Primary business requirement is for proposal development. "Heavy Privia user for 4 years"
Version control is strong; no constant re-naming. Excellent for archiving files, versions etc. Balky fairly often, though that could be because of our sign-in requirements. Some are afraid of it after a bad experience and if everyone doesn't use it, it can become a burden. Need buy-in from all contributors/authors. Otherwise Proposal Mgr or designee has to post for some authors - can get fairly hectic. We work on complex Federal bids - the archive function is critical, as is the version control. When everyone participates, it is an excellent collaboration platform. "Privia....a proposal nightmare or savior?" Platform great for collaboration while working on small or large Proposal production efforts. It allows the members to access and share their respective workloads, while maintaining privacy controls for unauthorized use. I have had a positive and seamless experience with Privia. Logging on process can sometimes become confusing, depending on the accessibility controls. Would like it to be accessible to a wider range of possible users, moving beyond the Corporate world. Its a good product. I would highly recommend it for team settings. Used Privia primarily for proposal production and submission process. "It is functional for document storage and collabooration." It is very efficient for storage and search capabilities. No more than 1 user can edit a document. Proposal development. Contributors and evaluator's can review from different locations and time zones. "Great product for version control in proposal production"
The version control and ability to monitor who was making edits is a very helpful tool when you are working with large teams. This was especially useful for my teams considering they would often be 10 or more members. There were problems with the system going off-lilne since it is a web-based application. Privia definitely helped with the proposal management process in regards to document control. "Used a limited version of this product to support Proposals for 4 years n a large Federal Contractor"
I believe there are better tools available. Purchased for configuration control and collaboration. I like the ease of use? It reminds me of Windows explorer! There wasn't anything that U disliked about privia. we use Privia for document control. "Privia is not user friendly"
I like that it pulls in my calendar very easily. It's not a user-friendly software. You need training. Account Management for outside team mates. * We monitor all Privia reviews to prevent fraudulent reviews and keep review quality high. We do not post reviews by company employees or direct competitors. Validated reviews require the user to submit a screenshot of the product containing their user ID, in order to verify a user is an actual user of the product. Hi there! Are you looking to implement a solution like Privia?